Zeno was an Isaurian Chieftain (c. 425 – 491), originally named Tarasicodissa. Isauria was in the mountains and isolated in southern modern Turkey. He was an Isaurian officer who defended Constantinople. He took the Greek name Zeno when he married the Emperor Leo I’s eldest daughter Ariadne in 466AD. Many believed he chose Zeno who many considered a barbarian to counter the Germany barbarians who had infiltrated the Empire. Leo I may have had a political balancing effect in mind. based upon contemporary sources, Zeno in 464AD warned the emperor of a plot by the son of the magister militum to assist the Sassanid King of Persia to invade Roman territory, promising to support the invasion. As reward for his loyalty, Zeno was appointed comes domesticorum, an office of great influence and prestige. Zeno and Ariadne had a son Leo II who took the throne in 474AD who raised his father to the throne as co-emperor. Upon the death of Leo II, Zeno ruled alone, but he was very unpopular because of his origin. To a large extent, this led to frequent revolts and usurpations. He is said to have been an epileptic and died during such an occurrence. His reign saw the end of the Western Roman Empire under Romulus Augustus, but he contributed much to stabilizing the eastern Empire. The first coins to be struck for Leo II, were minted in the name of “Leo and Zeno perpetual Augusti”, which date between February 9th and the 17th of November 474AD. On January 18th, 474AD, Leo I died. However, Leo II had not already been proclaimed co-emperor by his grandfather. Since Leo II was only seven years old, which was too young to rule by himself, Ariadne and her mother Verina prevailed upon him to crown Zeno, his father, as co-emperor, which he did on February 9th, 474AD. When Leo II became ill and died, Zeno became sole emperor. Zeno had to come to terms with the Vandals of King Genseric, who had threatened the sea commercial routes. Zeno succeeded in stipulating an “eternal” peace treaty between the Vandals and the Eastern Roman Empire, which allowed the Romans to pay ransoms for the prisoners in Vandal hands and which ended the Vandal persecution of Orthodox Christians in the Vandal territory. 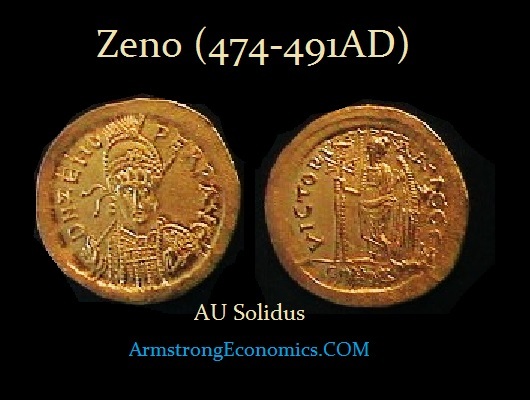 Despite this success, Zeno remained unpopular because of his barbarian origins. The Senate did not respect him so he relied upon the Isaurian component of the army, in particular to strengthen his bond with the Isaurian generals.